The Bayliner Element F18 will change the way you think about Bayliner's fishing boats. Period. Recently I went on assignment to test a Bayliner Element F18, for review on boats.com. (Watch the F18 video boat review, to see it for yourself). While I’ve never been a huge Bayliner fan, I do realize that they fill an important niche in the boating market, and since they haven’t built a dedicated fishing boat in years, I was quite interested in seeing what they came up with. Let me sum up the experience: forget everything you know about Bayliner’s fishing boats. This. Changes. Everything. 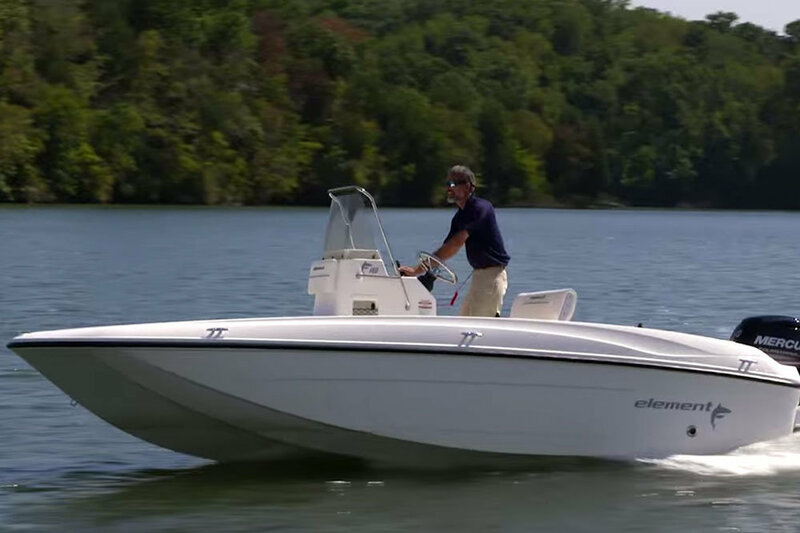 The Bayliner Element F18 will change the way you think about Bayliner’s fishing boats. Period. Reason number one: this boat is one of Bayliner’s first ever to be built with a wood-free, foam-cored stringer grid laminated into the hull. Reason number two: It takes a mere 90 horses to get this boat up and running, with a cruise in the mid 20’s and a top-end in the mid 30’s. Reason number three: List MSRP is well under $20,000, including a 90 horse Mercury outboard and a trailer. Actually, the base package starts at $18K and change, but when you consider things like dealer prep and shipping, the $20,000 mark is a safe one to work with. And in today’s boat market, where 18-footers can easily break $30,000 or even $40,000, that’s pretty stellar. So, what about the whole Element M-hull? If you haven’t heard of it before, this design is sort of a cross between a tri-hull, a V-hull, and a powercat. Looked at from the bow, it does in fact have an “M” like shape. And it has pretty unique characteristics as a result. For starters, the moment you step aboard you’ll realize that it’s significantly more stable than most 18′ boats. Walking from side to side, or drifting in a beam sea, rocking and rolling is dramatically reduced. Second, it handles well in a chop. Remember, this is a small boat, so yes it will slap and slam a bit in large waves. But in a relatively small wind-driven chop, you’ll be surprised at how well it handles it. Third (refer back to the performance numbers I mentioned earlier) this is an efficient hull, which doesn’t need gobs of power to reach respectable speeds. At cruise, you’re looking at getting better than six MPG. Of course, as with all hull designs, there are also down-sides. In this case, it’s a relative immunity to trim. The M-hull likes to run flat, and trimming up the outboards doesn’t bring the bow up much more than a degree or two. When you do bring the trim up, the prop tends to blow out in turns more quickly than it would with a common bay boat hull design. There are a few other down-sides to the F18, too: the bow hatches slam and need to have rubber bumpers added, to hush the noise and keep from spooking fish. Some latches are plastic, not stainless-steel. And the gunwales aren’t wide enough to house flush-mount rodholders. But on the flip-side, the livewell has an excellent design (and is plenty big), fold-down jump seats are built into the aft casting deck, and helm switches are lighted rockers. Plus, there’s a big safety bonus: unlike many small Bayliners built in the past, the F18 is self-bailing. When you consider all the up-sides and down-sides–then factor in that low price–it’s pretty easy to guess that the F18 is going to be a success. And one thing is for sure: it’ll change the way you think about Bayliner fishboats. Period.